When, by executive decree, all the canine pets of Megasaki City are exiled to a vast garbage-dump called Trash Island, 12-year-old Atari sets off alone in a miniature Junior-Turbo Prop and flies across the river in search of his bodyguard-dog, Spots. There, with the assistance of a pack of newly-found mongrel friends, he begins an epic journey that will decide the fate and future of the entire Prefecture. KIDS FIRST! Film Critic, Clayton P. comments, “Wes Anderson’s Isle of Dogs is a movie to be reckoned with. This incredibly unique piece of stop motion animation is totally different from the norm of today’s films.” Benjamin P. adds, “Wes Anderson’s direction is excellent. He thrives in stop-motion animation because he can meticulously craft each shot. His sometimes bizarre, yet charming style remains resonant, despite it being a change of pace from the stories he usually tells.” See their full reviews below. Wes Anderson’s Isle of Dogs is a movie to be reckoned with. This incredibly unique piece of stop motion animation is totally different from the norm of today’s films. Written and directed by Wes Anderson, it stars the voices of Bryan Cranston as Chief, Edward Norton as Rex, Bill Murray as Boss, Liev Schreiber as Spots, Bob Balaban as King, Scarlett Johansson as Nutmeg and Jeff Goldblum as Duke. It also stars Koyu Rankin as the young boy, Atari. It is the second animated film from Wes Anderson, after the wonderful Fantastic Mr. Fox. In fut ure Japan, where dogs are viewed as savage and disease ridden creatures, a young boy, Atari, searches for his dog, Spots. This dystopian world, created by his guardian, Mayor Kobayashi, disparages dogs but worships cats. Atari defies his guardian and along the way befriends some loyal, passionate pooches who help him on his fateful journey of finding his lost dog. One thing I particularly adore about Wes Anderson’s filmmaking is his irreverent humor and creativity. It’s almost as if Anderson has a patent on an new genre of filmmaking, that’s entirely his own. During the making of this film, Anderson was influenced by his love for Japanese cinema and two of the most monumental Japanese directors – Akira Kurosawa and Hayao Miyazaki. 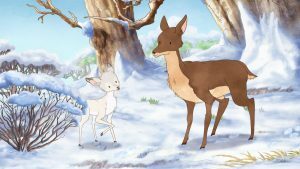 In an interview about his many influences for the film, he states “with Miyazaki you get nature and you get moments of peace, a kind of rhythm that is not in the American animation tradition…”. Later on, Anderson explains that during the scoring of the film he and his composer, Alexandre Desplat, had to rethink their approach to the soundtrack because the movie longed to be quiet. He later specifies that this aspect of the film also comes from Miyazaki. The stop motion animation style pairs perfectly with the pure grittiness of its creativity. 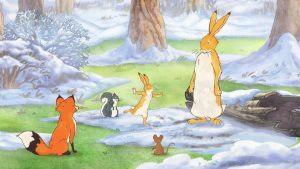 In most animated films you don’t hear the roughness or coarseness of the actors’ voices, but in Anderson’s film you do and it is the most lifelike. Also, despite the humor, Anderson doesn’t sugar coat the seriousness of the story. His films are always truthful and cut to the heart of the matter. I recommend Isle of Dogs for ages 12 to 18, due to its violence and sophisticated humor. Younger kids might not understand the ironic tone. I give it 5 out of 5 stars for bringing an incredibly unique vision to the mostly mundane animation of today. Isle of Dogs is a genius concept that only Wes Anderson could conjure up and makes for an enjoyable animated film with a quirky aesthetic. Isle of Dogs takes place 20 years from now in a futuristic Japan. A disease spreading among dogs ravages Megasaki City and the mayor issues a decree that banishes all dogs to a vast, sickening wasteland called Trash Island. The film focuses the story on a pack of dogs who spend their days roaming, trying to stay alive among fierce competition. A young boy named Atari crashes onto the island one day in search of his dog and the pack decides to help him. Wes Anderson’s direction is excellent. He thrives in stop-motion animation because he can meticulously craft each shot. His sometimes bizarre, yet charming style remains resonant, despite it being a change of pace from the stories he usually tells. 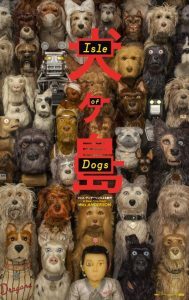 Isle of Dogs is an homage to Japanese filmmaking, especially the films of Akira Kurosawa, and relies on Japanese language and culture to tell its story. The film’s voice cast includes a range of famous actors, including longtime Wes Anderson partners Bill Murray and Tilda Swinton, as a pug oracle, as well as Yoko Ono as Assistant Scientist Yoko-ono and Jeff Goldblum as Duke, one of the dogs in the film’s showcase pack. My favorite character is Chief (Bryan Cranston). He is a stray dog who goes through a moving transformation as he starts off dreading the idea of having a master. But through his adventure with Atari, Chief starts to learn what it is to care about people and open himself up to them. Cranston gives Chief a weariness that lets you know his character has been through a lot. I recommend this film for ages 11 to 18, due to some violence involving dogs, some suggestive content and minor offensive language. 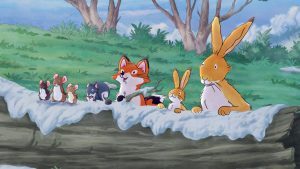 Note that, despite animation and dogs as main characters, this is not a kids’ film. It’s really geared pre-teens to adults. I give Isle of Dogs 4 out of 5 stars. I recommend this film for Wes Anderson fans and those who like a good adventure featuring man’s best friend. Although this film misses the chance to develop really interesting ideas and characters, it is still fun and hilarious in all the right ways. Isle of Dogs opens in theaters March 23, 2018 so check it out. After a string of garden gnome disappearances in London, Gnome & Juliet look to legendary detective Sherlock Gnomes to solve the case of their missing friends and family. KIDS FIRST! 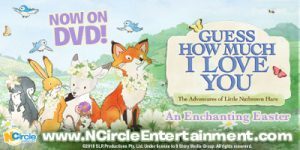 Film Critic Benjamin P. comments, “Sherlock Gnomes is a frequently clever animated film that has a few fun moments, yet suffers from a jumbled story and too many characters to fully engage you in the movie as a whole.” See his entire review below. 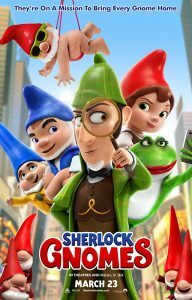 Sherlock Gnomes is a frequently clever animated film that has a few fun moments, yet suffers from a jumbled story and too many characters to fully engage you in the movie as a whole. Sherlock Gnomes is a sequel to Gnomeo and Juliet and brings together garden gnome versions of the famous detective and the Shakespearean couple from the first installment. Gnomeo and Juliet move to a new garden in London that disappoints their entire faction of gnomes. Gnomeo and Juliet are appointed the new leaders to turn the garden into a beautiful wonderland for their little village. Meanwhile, several gardens have been erased of all signs of gnomekind and soon, Gnomeo and Juliet’s is too. The dynamic duo of the incredibly smart, but sometimes selfish detective and protector of London’s garden gnomes Sherlock Gnomes and his trusty sidekick Watson are on the case and intend to catch the culprit and track down the missing gnomes, with the help of Gnomeo and Juliet. Unfortunately the collision of these literary duos doesn’t work very well. Their stories have very different characters and tones. The film makes clever references to Sherlock Holmes and his works that will be enjoyable for fans of the character’s inspiration, but the collaboration still feels forced. Gnomeo and Juliet go through a storyline that feels out of place and their conversations have a repetitive message. The characters feel less developed against the more engaging Sherlock Gnomes. My favorite character is Sherlock Gnome s (Johnny Depp). He embodies the qualities of the literary detective and makes his portrayal of Sherlock his own, giving him a more fun and comedic manner. He also nails Sherlock’s complex relationship with Watson. I recommend this film for ages 5 to 9 due to some crude humor. Younger kids will enjoy the film’s bright colors and caper elements and older kids and adults might enjoy some of the humor. 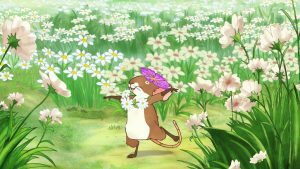 However, this film lacks the vivid animation and nuance that offers the same wide appeal of other animated films. I give it 2.5 out of 5 stars because the story is a bit confusing, although it has some characters and good laughs. It comes out in theaters on March 23, 2018 so check it out. Jake Pent ecost is a once-promising Jaeger pilot whose legendary father gave his life to secure humanity’s victory against the monstrous Kaiju. Jake has since abandoned his training only to become caught up in a criminal underworld. 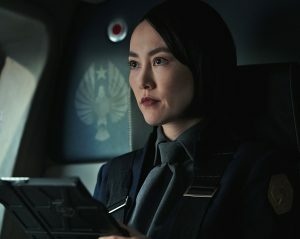 But when an even more unstoppable threat is unleashed to tear through cities and bring the world to its knees, Jake is given one last chance by his estranged sister, Mako Mori, to live up to his father’s legacy. Kamryn B. comments, “This action-packed film is pretty decent. I like that the plot continues from the last movie. The characters are as interesting as their story.” See her full review below. This action-packed film is pretty decent. I like that the plot continues from the last movie. The characters are as interesting as their story. The one problem is the sequencing. Some scenes are pointless and are ordered in such a way that they don’t make sense. However, if you like fighting robots, you’ll love it. 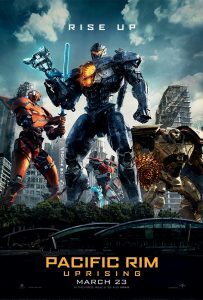 Pacific Rim: Uprising is the sequel to Pacific Rim. It takes place ten years after the war, which took place in the first film, was won. Jake Pentecost (John Boyegas), a carefree, retired pilot, is living life in a messed-up world. Through unwanted circumstances, he meets a 15-year old hacker named Amara Namani (Cailee Spaeny). With common personalities and different pasts, they create a bond that no one can break. With this new bond, old friends of Jake’s and new friends of Amara’s collaborate to fight the Kaiju for what is left of humanity. This film is directed and written by Steven S. DeKnight, known for producing the Netflix series Daredevil. DeKnight pulls the story together without losing your attention on the main crisis with the Kaiju. My hats off to the special effects team. The robot close-ups are so realistic, it seems like you can reach out and touch them. The robot fights are also extremely real. The intense music by Lorne Balfe makes the movie extremely engaging. It is also surprisingly comical. Jake Pentecost’s sarcastic tone makes you question whether the group is really living in a life or death situation or not. I rate this movie 4 out of 5 stars and recommend it for ages 14 to 18. It opens nationwide in theaters Friday, March 23, 2018 so look for it. Floogals: Project Egg Hunt – Earthly Experiences And Adventures Leading To Experimentation, Discovery And Observation! 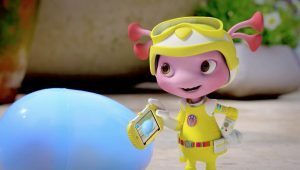 Join the Floogals on a mission of discovery as they explore Earth and the funny “hoomans” who live there! Each day, Captain Fleeker, First Officer Flo, and Junior Boomer encounter something that sparks their curiosity, setting in motion the day’s research “project” and triggering an exciting adventure! 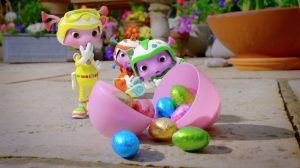 In Project Egg Hunt, the Floogals mistakenly think Mom and Dad Hooman have accidentally dropped candy eggs in the garden when in fact they have placed them there on purpose to create an egg hunt for their kids. The Floogals think they are being helpful and tidy up the eggs! Once the Floogals realize their mistake, they must get all the eggs back on the ground before the kids arrive so their fun day won’t be ruined. KIDS FIRST! Film Critic Damon F. comments, “I really enjoy the animation and admire how they have real people walking around with animated characters. It’s a very colorful, bright show with a new lesson in each episode.” Sahiba K. adds, “The characters are diverse, funny and kind and the storylines are clever yet simple thrills.” Eli B., KIDS FIRST! 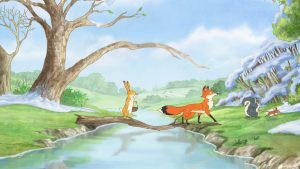 Adult juror wraps it up with, “The mix of crisp animation alongside “hoomans” (real actors) and live animals is really unique. 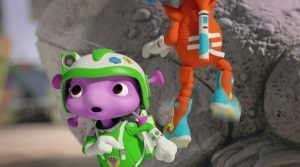 These little aliens sometimes get into a bit of trouble, which they use problem-solving and teamwork to remedy as they learn something along the way.” See their full reviews below. 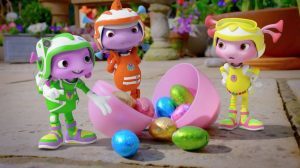 Floogals Project Egg Hunt is a DVD about tiny secret aliens from planet Floon that sneak around your house learning about humans or, as they call them, hoomans. I really enjoy the animation and admire how they have real people walking around with animated characters. It’s a very colorful, bright show with a new lesson in each episode. The three Floogals in this series are Captain Fleeker (Rasmus Hardiker), the bravest of the group, First Officer Flo (Jules de Jongh), the smartest of the group and Junior Boomer (Hugo Harold-Harrison), who is clumsy and crazy in most episodes, which makes him very funny. These Floogals wander around a house, encountering new things that the ‘hoomans’ are doing. Then they spend the day researching what the object or activity is and sometimes try to help, often with hilarious results. At the end of each episode they send their report to their leader, who always likes it. So, they receive a strip of stickers based on their observations. The episodes in this DVD are, Project Egg Hunt, Project Rainbow, Project Kite, Project Picnic and Project Tortoise. 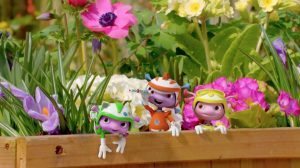 My favorite episode is Project Rainbow which is about the Floogals walking in the yard and, as they take cover from a sudden rain shower, they hear the girl “hooman” talk about a rainbow and they decide to investigate rainbows. I like this episode because I can relate to it, as I loved trying to find the end of the rainbow when I was younger. 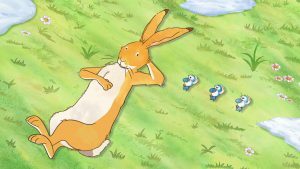 Another good episode is called, Project Tortoise which is about the Floogals discovering a tortoise and deciding to research it more, but when they look back at the tortoise he is gone. The Floogals must find him and bring him home. The title episode, Project Egg Hunt, is very funny because they almost ruin the egg hunt by trying to help. My favorite character is Junior Boomer because he is always being clumsy and causing accidents that sometimes helps the team in unexpected ways. The message of this DVD is, if you work together you can do anything. 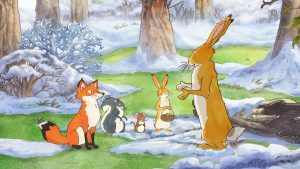 I rate this DVD 3 out of 5 stars and recommend it for ages 3 to 5 because every episode teaches a new lesson and is very repetitive. Older kids and adults might find it amusing too. This DVD is available on Blu-Ray and standard DVD now so, check it out. 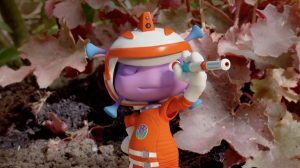 Floogals: Project E gg Hunt, directed by Ruth Ducker is an imaginative, exciting space adventure that seems to take place right in my own backyard! The characters are diverse, funny and kind and the storylines are clever yet simple thrills. 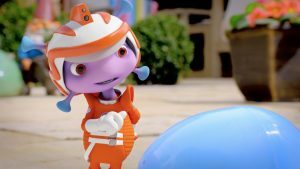 The story follows three Floogals – Captain Fleeker, First Officer Flo and Junior Boomer who are sent to explore and understand the interesting ways of the Hoomans. The animation and voices add to the special aspect of each Floogal that makes them unique. For example, Junior Boomer is innocent and the youngest of the three which is shown by his bigger eyes and wide smile. The voice actors are able to capture the character’s personality in their voice. Dominique Moore voices First Officer Flo and expresses the sweetness of her character in her voice. My favorite part is how the Hoomans are considered the mysterious aliens and the Floogals are there to learn about these queer creatures and their ways. DVD now so, be sure to look for it. 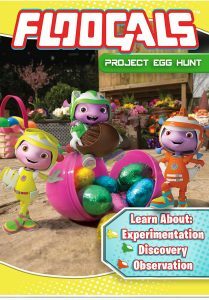 Posted in DVDs Released | Comments Off on Floogals: Project Egg Hunt – Earthly Experiences And Adventures Leading To Experimentation, Discovery And Observation! You are currently browsing the KIDS FIRST! News weblog archives for March, 2018.